Continuing the Japanese theme of the last couple posts, I went looking at Mijk Van Dijk again, specifically the Tokyo Trax EP, which is filled with amazingly of-the-era track titles like Little Lonely Otaku. Oversimplified takes on the culture aside, the tunes contained within are quite good. While looking though I found the sequel to the Game Trax Vol. 1 EP I posted not too long ago, and this time it wasn't Ridge Racer, it was Armored Core. Naturally I was interested, cos Armored Core 2 had a quality soundtrack. Imagine my surprise when I find out that he's been behind that tune all along. Seems that somehow the tune names got swapped on the official release of the full OST, and what's listed as Robo.Com.Bat is actually the theme, and the tunes took a bit of finding as it's not sorted on his soundcloud like vol. 1 too. Not that Robo.Com.Bat is any worse by any stretch of the imagination, I'm a sucker for early 00's 'techy' tune titles as-is, and I absolutely adore those high pitched backing synths. The final tune, the also 2000's techy titled Robo@Tek is probably the most conventional of the trio, and would be easily at home on the dancefloor as it is on the OST. 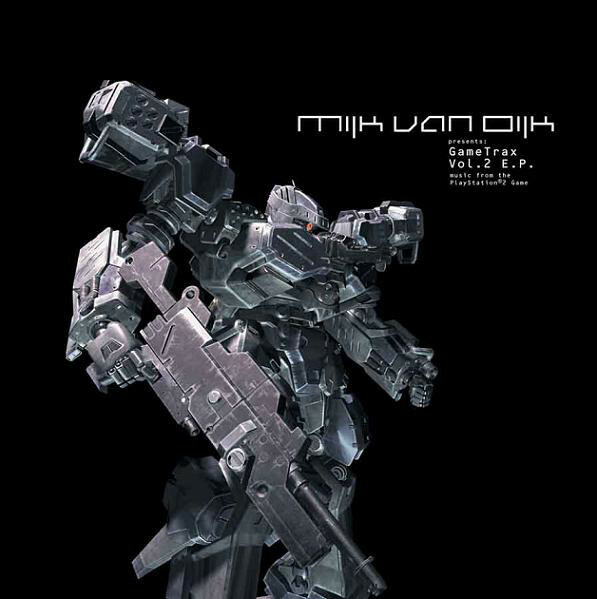 It actually reminds me a whole bunch of the Ghost In The Shell game OST; Megatech Body Co., which is probably unsurprising as Mijk also appeared on there (though truth be told some of his tunes on that were too minimal for me). Enjoy yet another time capsule back 16 years or so.